If you're searching for the most bang for your buck within the runabout market, these ten affordable models should be at the top of your list. Alfred P. Sloan Jr. was the CEO of General Motors from 1923 to 1946. One his more renowned axioms was that GM make a car for every purse and purpose. In the marine industry, there aren’t many boatbuilders who build a boat for every purse and purpose, but they don’t have to. Boatbuilders have their specialties, which works well in the marine industry, as long as they don’t lose sight of that coveted entry-level buyer. Some entry-level buyers might be satisfied with a good used boat, but could come away disappointed from the experience of owning something that perhaps hasn’t been cared for. For those buyers, the new entry-level boat hits the sweet spot, for it must first be reliable, but also affordable. 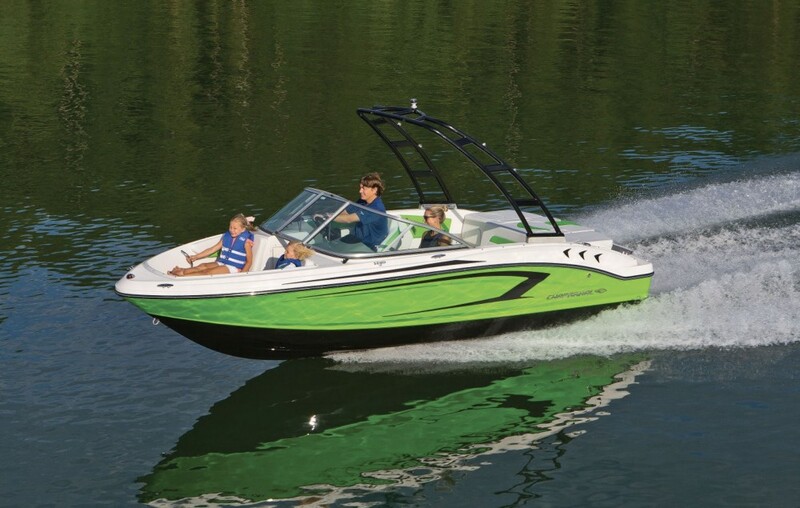 We’ve compiled a list of the top 10 affordable runabouts available on the market today. 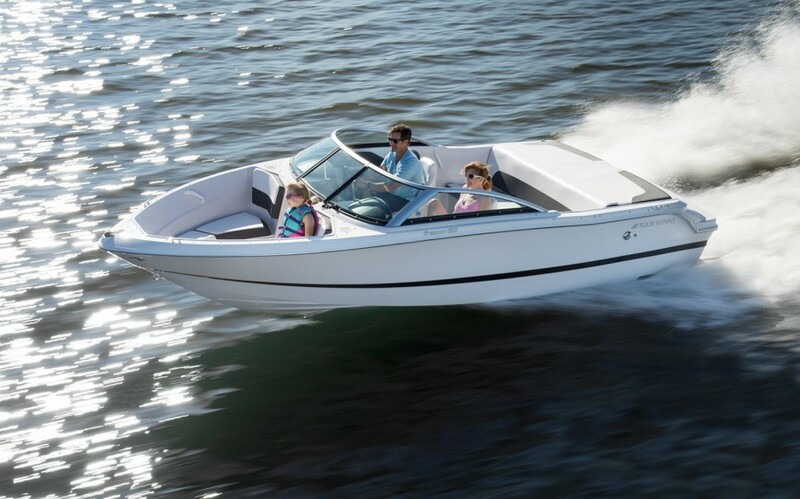 These boats fit the bill for that entry level buyer, because they offer a cost-effective way to get out on the water with the family blanketed in the comfort of a factory warranty. 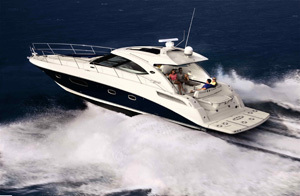 It would be impossible to have a discussion on affordable boating without including Bayliner. 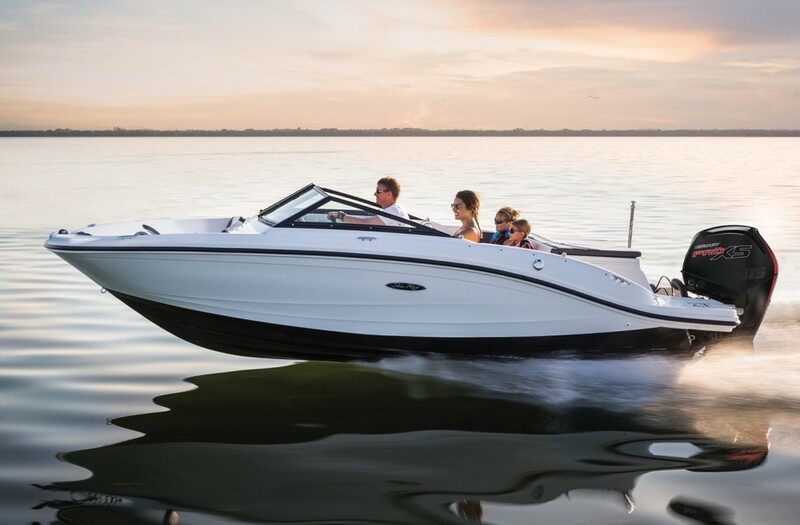 It could be argued that no other manufacturer has offered more in terms of affordable entries into boating than Bayliner, and the 160 Bowrider is a perfect example. Like all of the boats in this feature, the 160 Bowrider comes with everything you need standard, and not a stitch more. The 160 carries up to five people with a 60-horse four-stroke engine, which is plenty for a 16-footer. It comes with cupholders throughout, a battery switch and a 500 GPH bilge pump. The helm is fitted with enough gauges to keep you out of trouble, bucket seats and a tilt steering column. 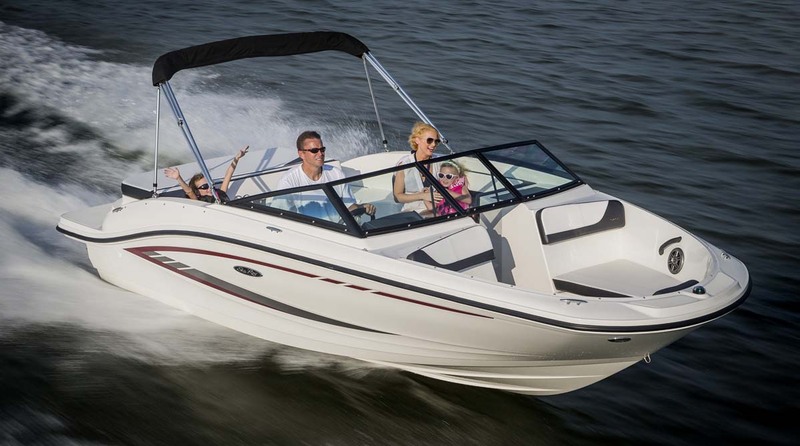 The 160 also comes with a transom ladder, cleats fore and aft, safety grab handles and a wraparound windshield. You take delivery on a standard single-axle painted trailer, in any color you want, as long as it’s black. The 160 has an options list, too, but they drive up the base price, which is the lowest in this feature. Base MSRP is $17,344, which includes the trailer and destination charges. 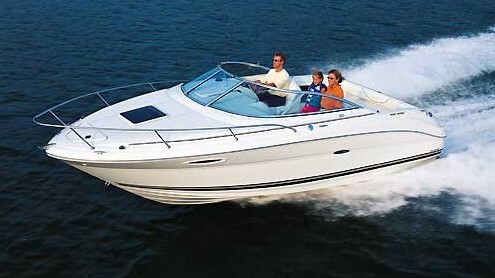 See Bayliner 160 Bowrider listings. With a base price of $30,854, the Four Winns Freedom 190 is a great little entry-level runabout built with impressive quality and attention to detail. That’s important to retaining customers, especially first-time buyers, which can turn into two-time buyers when and if they decide to get something larger. We’ve sung its praises before, and the Freedom 190 is certainly affordable, small enough to stash in your garage and light enough that you can tow it with the smallest of SUVs. What’s more, for an entry-level offering, it’s pretty well appointed. For instance, it has an in-sole locker with a hinged lid supported by a gas strut, hinged stowage beneath the aft bench and truly innovative aft-facing lounges tucked under the conventional sun pad. 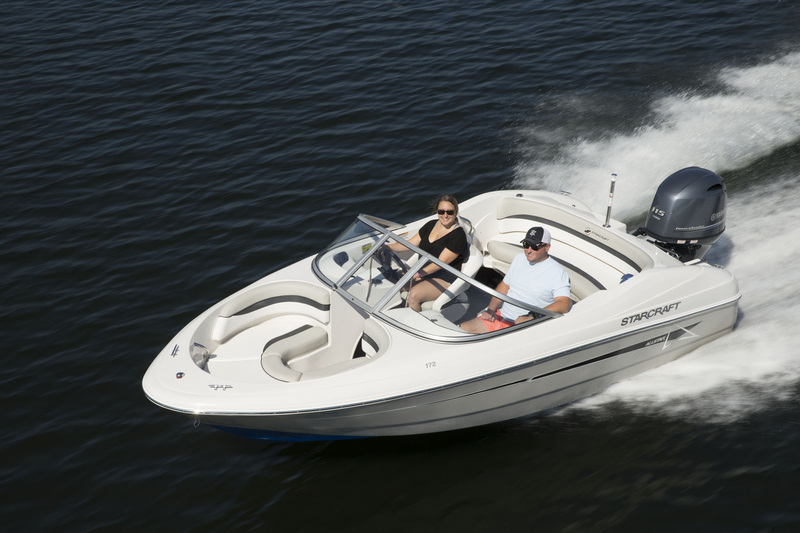 Standard power is the 200 HP MerCruiser 4.5-liter V6, which is the Mercury’s proprietary engine designed specifically for sterndrive applications, not a General Motors car or truck engine “marinized” for use in boats. Even with no options, the Four Winns Freedom 190 is a pretty stout package. At $29,895 the Chaparral 19 H2O Sport comes in a just under that $30k mark, which is just under the wire for entry level buyers. For the base price, buyers can choose from seven colors for the hullsides. 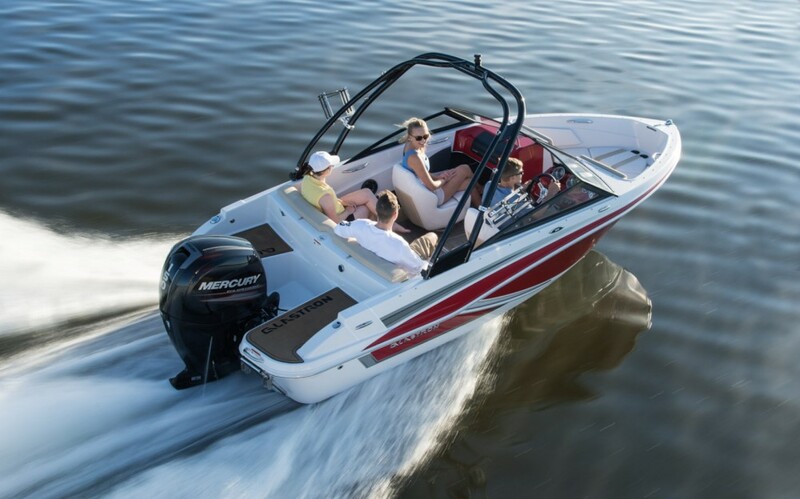 Standard power is the 200 HP MerCruiser 4.5-liter V6, which is plenty considering the boat only weighs 2,540 pounds. You also get a powder-coated single-axle trailer as part of the standard equipment. Inside, there’s a lot to like about the 19 H2O sport. For example, there is an abundance of stowage, and not just open compartments. We’re talking about stowage with hinged lids, self-draining built-in coolers, gas struts on the in-deck locker. There’s also a handsome dashboard with full instrumentation. That’s one of the benefits of buying an entry-level product from a manufacturer who builds larger and more luxurious craft. Some of the goodies “trickle down” from its larger boats without adding too much to the price. High-volume manufacturing the one place where trickle-down theory actually works. Other big-boat items include a cockpit drainage system, better than entry-level bucket seats, cockpit lighting, coaming storage and an AM/FM Bluetooth stereo with an auxiliary port. It’s one of the more expensive boats in this roundup, but Chaparral certainly presents its case for value in the 19 H2O Sport. See Chaparral 190 H2O Sport listings. New for 2018, the Larson LX 160 OB presents yet another great value for entry level shoppers from an established builder. That can bring peace of mind to an otherwise nervous first-time buyer. After all, Larson has been around for more than 100 years, so buyers can take comfort in that. They also can take comfort in the price. At a base MSRP of just $25,864, the LX 160 OB comes with a 60 HP Mercury outboard and a lifetime structural warranty that’s transferrable. You also can get Evinrude, Suzuki or Yamaha power if you like, but that will change the base price. Unexpected niceties include a sport steering wheel on a tilt column, front bucket seats with flip-up thigh bolsters for greater outward visibility. There’s in-deck stowage, bow seating with a forward cushion that lifts out to create a step for easy boarding, retractable cleats and a standard single-axle trailer. You can even get a few options and still keep the price under $30k. See Larson LX 160 OB listings. The name Scout doesn’t exactly leap to mind when thinking about runabouts. The company has made a name for itself in its 25 years in business by building an expanding line of center consoles and what it calls luxury center consoles. However, the company also has been building dual consoles the whole time, too, and the 175 Sport Dorado is just one of them. Priced to move at just $27,995, the 175 Sport Dorado comes with a Yamaha 90 HP outboard and a single-axle aluminum trailer. Built for toughness and ease of maintenance, the 175 Dorado Scout comes fitted with bucket seats for driver and observer, jump seats at the stern and ahead of each console and a large pad up at the bow. The pad detaches to create a standing platform for fishing. Underneath lies a massive stowage compartment, forward of which is nice large anchor locker. 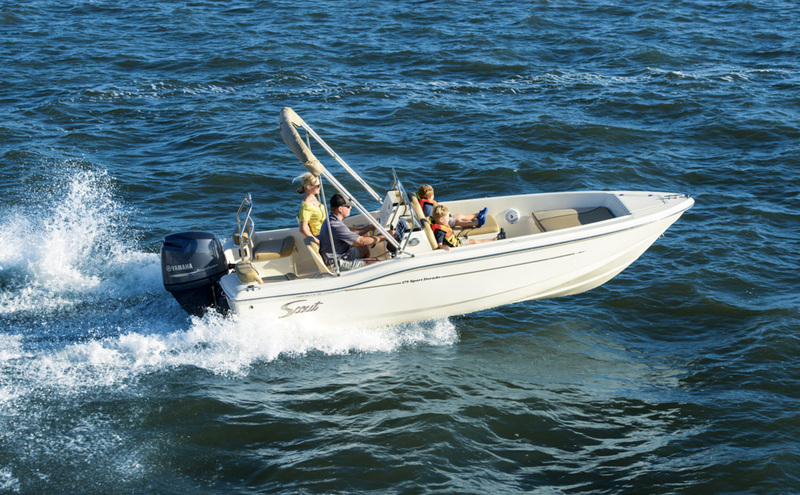 Even though Scout gears its boats toward fishing, the 175 Dorado Sport comes with a tow bar mounted forward of the outboard engine. So, sure, the name Scout might not be immediately apparent as a runabout builder, but the 175 Dorado Sport makes a pretty good argument for itself. See Scout 175 Sport Dorado listings. When you talk about boatbuilders with a long history, Rinker is certainly one of them. Company founder L.E. Rinker was a dairy farmer who began building fishing and racing boats in Indiana in the 1930s. By the 1950s, Rinker-built was a full-time business that has continued to this day. 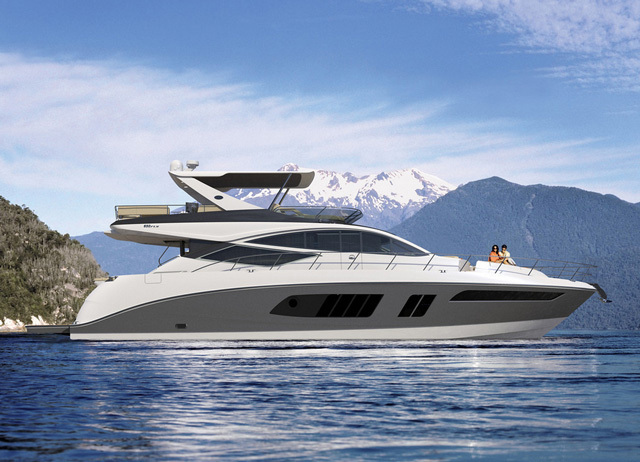 The company now offers everything up to a 37-foot cabin cruiser. At the other end of its model lineup lies the 17QX OB, a smart little runabout with a base MSRP of $26,854. For that kind of money, you get a 90 HP Suzuki outboard and a choice of eight colors on the hullsides. Ninety horsepower should be plenty because the 17QX OB weighs just 1,750 pounds! A tilt steering column is standard as is a sport wheel, stainless-steel cupholders, dual bucket seats with flip-up bolsters and in-deck stowage. You also get a stainless boarding ladder, a Kicker stereo with Bluetooth input and a tinted wraparound windshield. You also get a fixed ski tow and three cleats. Buyers also can rest assured Rinker is going to be there in the long run. See Rinker 17QX OB listings. A hallmark of the Glastron brand is the garden variety runabout, so it makes perfect sense that Glastron would build the GT180, an outboard-powered runabout with all the design elements you expect in a Glastron. 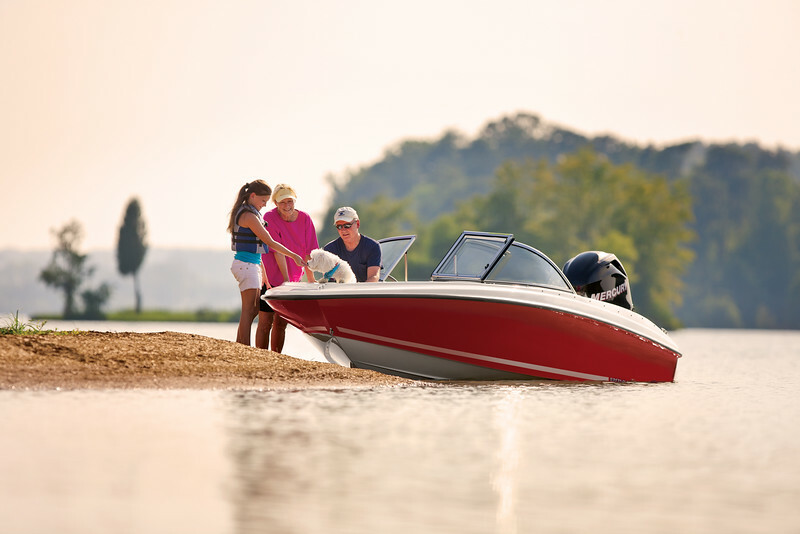 With a base MSRP of $24,848, the GT 180 comes standard with a Mercury 90 HP four-stroke outboard. There is really no need for an optional engine because the boat only weighs 2,000 pounds. What’s more, the boat is built using Glastron’s proprietary SSV hull design, which gets on plane quickly and makes small boats feel larger than they are due to how well they handle the chop. Yes, the 180 is an entry-level boat, but it delivers on style. Buyers can choose from three hull colors and three interior colors. Styling is a step up from the norm in entry level models. The GT 180 has a handsome dashboard, with instruments set in handsome slash-cut bezels and are topped with a color-contrasting “brow.” The glove box houses the stereo controls and charging stations for devices of all kinds. 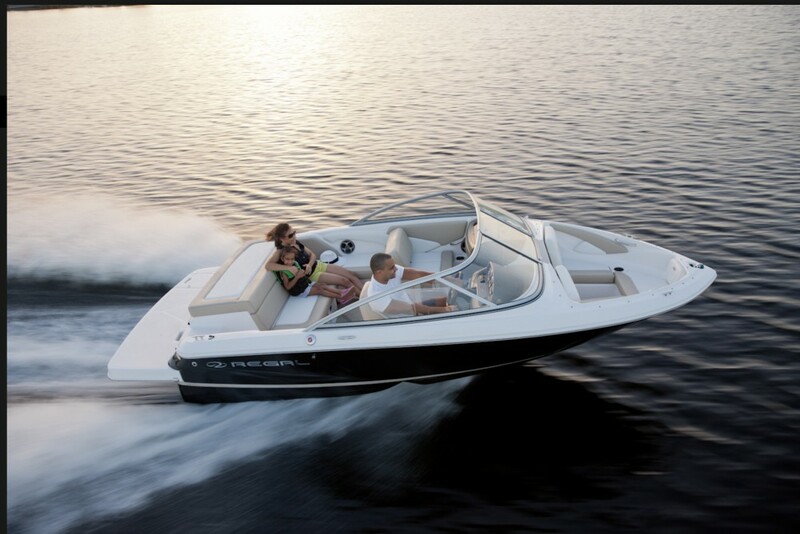 Both front seats feature flip-up bolsters and the aft swim platforms are treated with Sea Dek foam padding. See Glaston GT 180 listings. Well-known brands deliver something intangible, something you can’t see on a build sheet or during a walk-through. Big-name brands tend to hold their value better over time and offer higher resale values when it’s time to move up. What’s more, technology and features developed on a builders larger, more expensive models can make its way into entry-level products. Take Regal’s 1900 ES, for example. It’s priced at $27,190, and it comes with a 200 HP Volvo Penta V6 and single-prop drive. It also comes with some not-so-entry-level features such as a walk-through to the swim platform and a two-place observer seat with a reversible backrest. Regal also offers buyers a choice of colors on the hullside at no extra cost, three different interior choices at no cost as well as a standard canvas package in matching colors. The generous array of standard features should keep owners satisfied for a long time, but if they do decide to sell and move up, it’s easy to sell or trade in with a name-brand boat. See Regal 1900 ES listings. The highest-priced model in this roundup, the Sea Ray SPX 190 Outboard makes its own case for value, delivering features not found in other entry level models. That begins with the observer seat on the port side, which is truly innovative. With the forward cushion in the up position, it functions as a normal, forward facing observer seat. In the down position, the seat becomes a cozy lounge big enough for two people to face inward. Up front, the bow seating area is larger than normal for a 19-foot runabout. At the stern, there’s a walk-through to the swim platform, which comes fitted with a four-step, telescoping boarding ladder, and is truly full-width despite the use of an outboard engine. Because this boat also is available as a stern drive, there’s plenty of stowage beneath the sun pad. The SPX 190 OB come standard with a Mercury 115 HP outboard and a single-axle trailer. 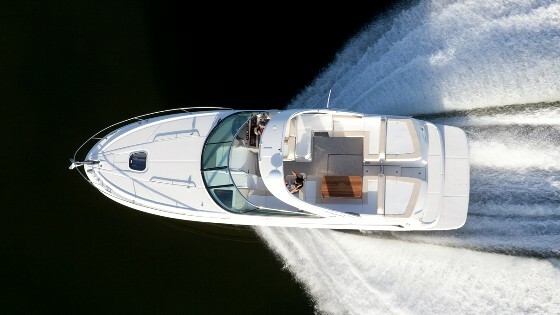 See Sea Ray SPX 190 listings. If you know a little bit about boat manufacturing, you can see how Starcraft economizes in building its 172 OB Sport. The hull is one piece and so is the deck, which forms the basis for the bow seating, the dashboard on both sides of the boat, the rear seat base and the swim platform. It’s all molded as one piece, which saves in manufacturing costs. The good news is that recipe also makes for a more solid finished product because there are fewer pieces to put together. It’s also what makes it more affordable. Priced at right around $22,500, the 172 OB Sport is a viable choice for an entry level runabout. Like every other boat in this roundup, the 172 OB Sport comes with everything you need. Unlike some of the others, it also comes with a few niceties you might expect. For example, it comes with full instrumentation so you can keep an eye on the mechanicals. It also comes with docking lights. Docking lights on an entry-level boat! 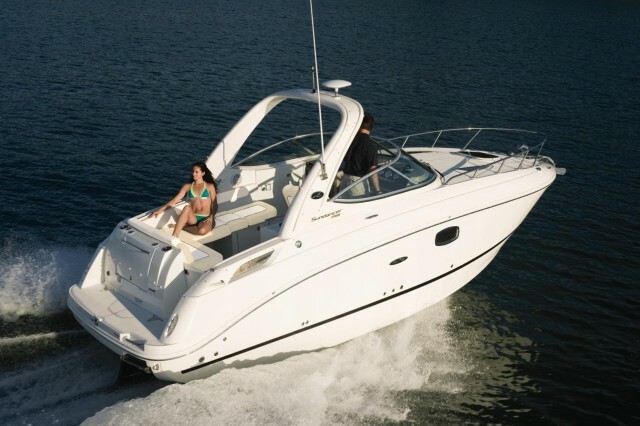 Other standard features include cleats and a ski tow and a transom walk-through with cupholders throughout. Because of its low starting price, you could add a bunch of options—cool features like a bimini top, blue underwater lighting, a depth finder and tilt steering—and still come in at less than the base MSRP of other models in this roundup. Regardless of how Starcraft kept the price down on the 172 OB Sport, the beneficiary is the buyer. See Starcraft 172 OB Sport listings. Don't forget to check out our Runabouts explore page to learn more.